Looking for ways to break through the communication barrier between you and your prospects? In today’s digital age, it’s easy for your target market to become oversaturated with online advertisements and email marketing. It’s time to take a proven approach to reaching your prospects: print media. Print media should be included in one’s marketing strategy for countless reasons. In its most effective state, marketing drives consumers to interact with a brand, and there is no better way to do that than with tangible, printed content. Since printed items induce more engagement from the consumer, viewers tend to recall what they see twice as much as online media. Printed marketing efforts are also more likely to be read rather than skimmed over when compared to digital items, with over 79% of customers acting upon a printed message compared to only 45% acting upon an email. There is also a longevity in using print that seems to outlast that of online media. Where a person on the internet might see your message once or twice while skimming, a printed poster or sign can hang for months in direct sight of your target audience. Not only do these items like flyers and brochures drive user engagement and viewing, but they’re actually sending more consumers to an online search and in turn, increasing businesses’ return on investment. Marketing strategies that integrate printed items into their mix have shown the ability to increase ROI by almost 240%. 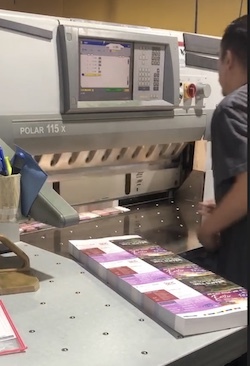 On top of being profit-increasing, printed materials show credibility and dedication to a business and its customers and can increase brand sentiment. Using printed media offers an in-person experience to your customers that cannot be replicated in a digital space - and they will appreciate you for it! In this world of advertising clutter and digital invasion, consumers appreciate brands whose marketing mixes include real world printed items, and not always the in-your-face digital alternative. However, creating a great library of printed materials and publications doesn’t mean that you abandon your online marketing efforts. It’s actually quite the contrary. Integrating your digital and print marketing makes your marketing campaigns stronger, more effective and more provide a higher ROI. It’s time to upgrade your marketing mix - it’s time to get printing. Please contact us with any printing inquiry and questions! We are happy to help! 4 Color Press - your trusted source in the Dallas/Fort Worth area for all things printed.